Consultant Lori Faha with an illustration of a stormwater feature in a parking lot. Albany has plans for a program to keep storm water from polluting our waterways, and it looks to me that the city staff has taken pains to keep any additional regulatory burden to a minimum. The city’s proposed answer to impending regulations is that new land developments above a certain size will have to incorporate features that let rain soak into the ground rather than being sluiced down the storm drains straight into our rivers and creeks. The new requirements would apply to developments on sites totaling one acre or more and either having more than three houses or laying down upwards of 8,100 square feet of impervious surface such as paving. The new rules would require such projects to provide for shallow planters, swales or similar features to soak up rainwater. In most cases the features could be installed as part of landscaping required anyway, such as in the parking strips along new streets, and thus should not cost much extra. 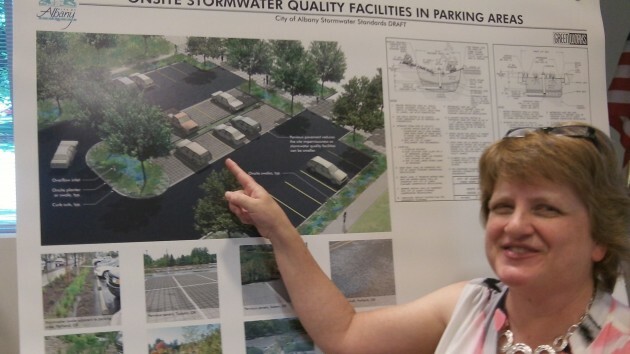 On public projects such as building streets, or parking lots in parks, the storm water features would be installed and maintained by the city itself. On private new developments, installation and maintenance would be up to the owners. New sidewalks could incorporate swales like this. The Albany City Council and Planning Commission held a joint work session Monday and got briefed on the so-called “storm water quality program” by Jeff Blaine, the city engineer and assistant public works director, and others including Lori Faha, also an engineer, from the Portland consulting firm GreenWorks. Faha told me after the meeting that microbes in the soil of these features take care of oil and other pollutants from parking lots and streets. If there’s any maintenance to be done, it would be clearing out weeds or sediment. Safety was one concern. 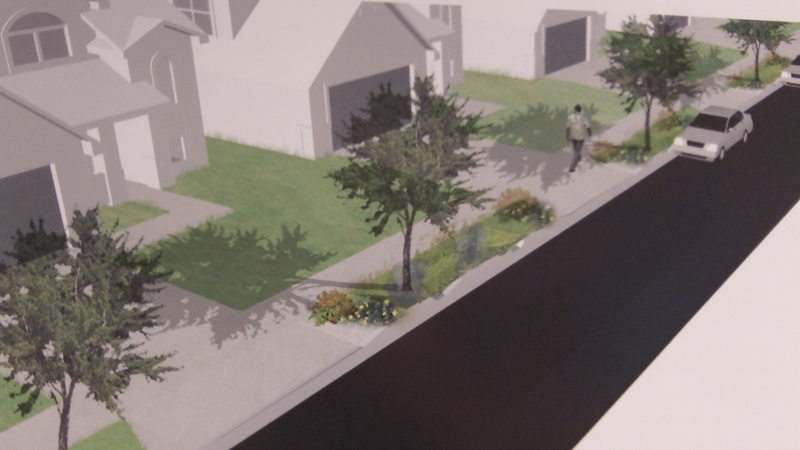 What if somebody steps into a deep “rain garden” such as the ones on Albany’s Broadalbin Street? The word from cities where these projects have been done was that no injuries or accidents had been reported. Blaine says the city government can absorb, for now, whatever public costs the program entails. In the long run, though, he says the council won’t be able to avoid discussions about a funding source. If and when that time comes, there will be loud complaints about the city wanting to impose a “rain tax.” But if the program is run as frugally and intelligently as it was designed, the council may avoid this. And in any case, before the council even considers a revenue source to deal with rain, it has an obligation to fix certain old streets that are falling apart. Hey, why not just call the potholes “Storm Water Drainage & Dispersal Features” (SWD&DF’s in bureaucrat-speak), declare them a feature not a detraction and heck, even tax nearby property owners for having such an attraction adjacent to their property. Just think, the bigger the pothole the greater the tax. C’mon Albany, lets get creative here!